Le Cordon Bleu Malaysia participates at Worldchefs Congress & Expo 2018 "Asia On A Plate"
" ASIA ON A PLATE "
Held for the first time ever in Malaysia and Asia the World Chef Congress & Expo brought together more than 105 members countries to share the latest culinary innovations and raise global culinary standards through idea sharing and networking. 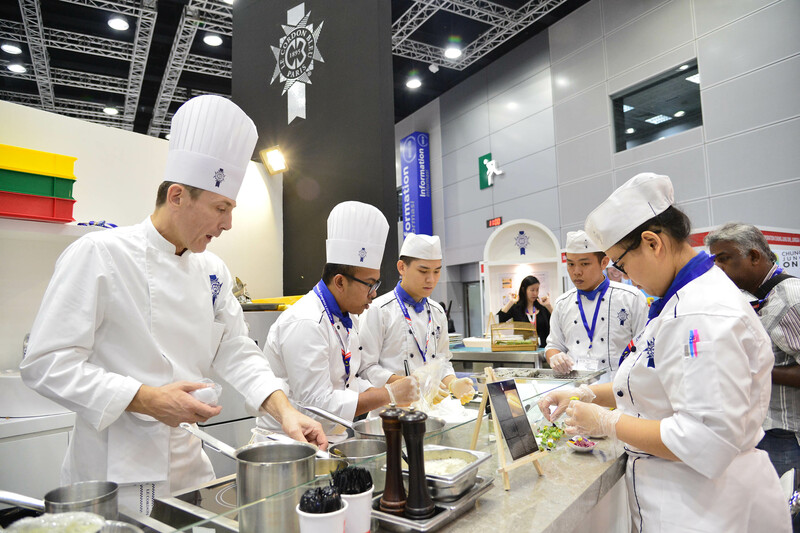 Malaysia play host to more than 1000 Chef delegates from around the, were joined by many local chefs over the 4 days biennial event at the Kuala Lumpur Convention Centre. Master Chefs of Le Cordon Bleu chose to feature unique Malaysian ingredients which our chefs find fascinating and gave prominence at this world stage to share with all present how they can be created into interesting and delicious dishes. Ingredients featured such as Durian, the King of fruits in Malaysia was stuffed in quail and which was then baked and roasted before serving in its own Jus was a hit to many chefs and visitors. 2 fish varieties indigenous to this part of the world, the Silver promfret and Snakehead fish ( Toman) were also made into delicious creations for all to savour at the Expo. Black Chicken whom Chinese mainly use to make into a healthy soup concoction was presented as a sausage with a French Twist. A special survey was designed with the purpose of finding out how much the Malaysian cuisine is known worldwide and what dishes are popular and listed as favourites. Data collected will be used by Le Cordon Bleu for review and to help them design a Malaysian Cuisine Programme to be taught in the near future. Le Cordon Bleu also invited local celebrity chefs, Datuk (Dr) Chef Wan and Chef Debbie Teoh to share distinct features in Malaysian cuisine – Imperial Malaysia & Straits wedding dishes in a series of talks. They were also joined by Alumni of Le Cordon Bleu, Chef Dato’ Fazley Yaakob, Chef Darren Chin and Chef Brian who shared their passion in cooking with local ingredients.